Established in 1939, Sciaky, Inc. is the most trusted provider of advanced welding systems and job shop welding services in the fabrication market. The company provides a wide selection of electron beam welders, electron beam additive manufacturing (EBAM®) solutions and advanced arc welders makes them the most versatile welding solutions supplier on the planet. We buy and sell Used Spot and Seam welding equipment from Sciaky. Manufacturing welding machines in the UK since 1934, Sciaky are world-renowned in all aspects of resistance welding, seam welding and spot welding. Specialists in Automobile resistance welding, pioneering the resistance welding of Aluminium Alloys to demanding aerospace standards and developed machines with capability to weld Light Alloys and Heat-resisting materials for aero engines. Also providing automatic assembly resistance welders and robot welding solutions to the Automobile industry. 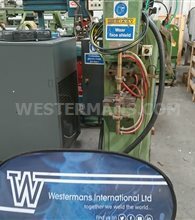 Interested in buying Sciaky welding machines? Check our stock of Sciaky machines here. These are available normally with 5-7 days from order. Save both time and money buying a second hand fully guaranteed machines. Early pioneers of resistance welding equipment and techniques to spot weld heat-treatable Aluminium Alloys which were becoming popular in airframe construction; they made resistance spot welding machines operating on the ‘stored-energy’ system. These could produce the very high secondary currents needed to spot weld the very low-resistance materials and at the same time apply a very fast forging force to consolidate the weld nuggets and satisfy the demanding standards required for airborne fabrications. A typical car body can have upwards of 3,000 resistance spot and projection welds, some on sub-assemblies and some in final body assembly; in the early days large quantities of standard pedestal and portable spot and seam welders were used, each requiring an operator. Sciaky supply resistance welding machines to a wide range of industries and have become familiar with their specific and varied requirements, in fact if you join materials in metal or produce wire goods we have probably already provided a solution to your production needs. Sciaky undertake Welding Machine Design and Welding Machine Manufacture.